Oshawott in game: 4,833 Who? Important notice! Pokemon Oshawott is a fictional character of humans. 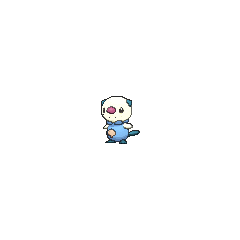 Oshawott (Japanese: ????? 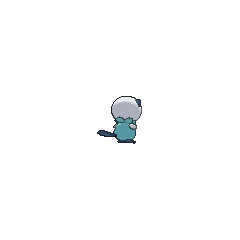 Mijumaru) is a Water-type Pokémon introduced in Generation V.
It evolves into Dewott starting at level 17, which evolves into Samurott starting at level 36. Along with Snivy and Tepig, Oshawott is one of three starter Pokémon of Unova available at the beginning of Pokémon Black, White, Black 2, and White 2. 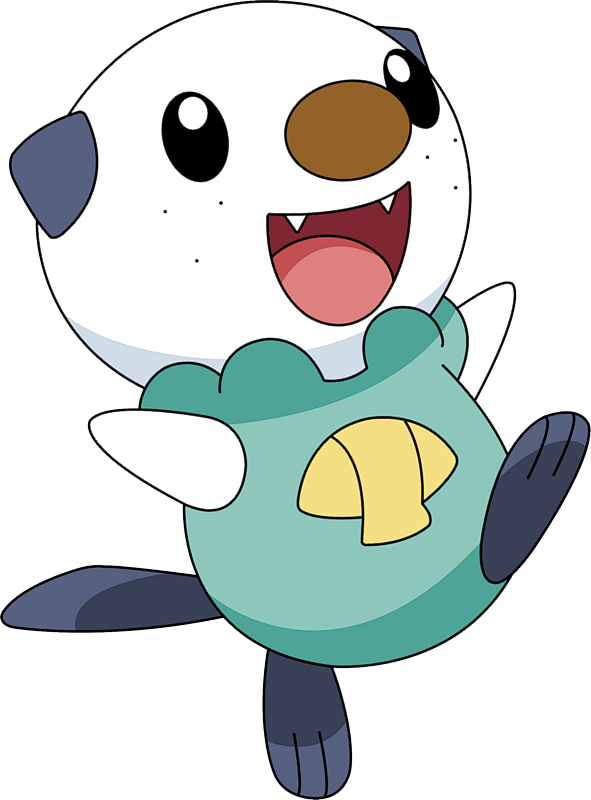 Oshawott is a bipedal sea otter-like Pokémon. It has a spherical white head with small, triangular dark-blue ears on the sides. 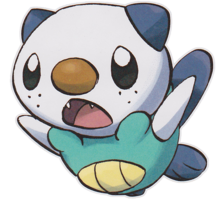 Oshawott's eyes are dark and its dark orange nose is shaped like a horizontal oval. Several freckles cover its cheeks which may be premature whiskers, and two pointed teeth can be seen when it opens its mouth. The light blue fur on its body forms bubble shapes around its neck. Its arms are white and rounded, while its feet are dark blue with three toes each. It also possesses a rudder-like dark blue tail. It carries a pale yellow seashell called a "scalchop" on its belly. This shell is made of the same material as its claws, and is used for both battle and cracking hard berries. Ash's Oshawott first appears in In The Shadow of Zekrom!, under the ownership of Professor Juniper. He begins to admire Ash and decides to leave the lab and follow him wherever he goes. He then saves Ash and Iris from Team Rocket in Enter Iris and Axew! and reappears again in A Sandile Gusher of Change! where he officially joins Ash's party. Another Oshawott appeared in New Places... Familiar Faces! as a starter Professor Juniper offered for Nanette. However, she chose Tepig instead. Several Oshawott appeared in Crowning the Scalchop King!. In A Connoisseur's Revenge! multiple Trainers' Oshawott were seen at a Poké Mart. Later, a flashback of Burgundy's Dewott as an Oshawott was shown after it had been beaten by Cilan's Pansage. An Oshawott appears in a fantasy in Ash and N: A Clash of Ideals!. An Oshawott appeared as a mask in Capacia Island UFO!. An Oshawott appeared as a plush toy in A Jolting Switcheroo!. BW003 Oshawott Ash's Pokédex Oshawott, the Sea Otter Pokémon. Oshawott attacks and defends using the scalchop that can be removed from its stomach. Ash owns an Oshawott in the manga adaptations of the movies in the Best Wishes series. Arata chose Oshawott as his starter Pokémon when it battled Roxie's Koffing. It evolved into Dewott and then into Samurott. Oshawott, along with Tepig and Snivy appear when Black accidentally drops his box containing the Pokémon. When Tep and Snivy begin fighting, Oshawott attempts to break them up, only to get hurt in the process. After getting annoyed, it attacks them and sends Tep running off. It was later chosen by Bianca because she thought it was cute. Cedric Juniper originally had one that was supposed to be given to new Trainers, but he decided to keep it after N failed to liberate it. Oshawott is Bianca's starter Pokémon in the Be the Best! Pokémon B+W manga series. Touya chose Oshawott as his starter Pokémon. An Oshawott appears in PMBW01 as part of the trio of starters Professor Juniper was giving away. An Oshawott first appeared in TA39. Oshawott appears as a Poké Ball summon. It behaves similarly to Piplup in Brawl. 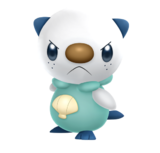 NA: Oshawott carries a little weapon on its stomach known as a scalchop, which can be used to either defend or attack. Its Surf move can knock opponents off the stage, but if you use a reflecting move at just the right moment, you can turn the tide against it! 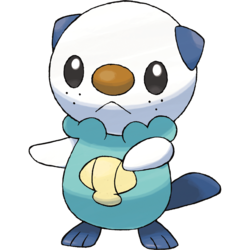 PAL: Oshawott carries a little shell on its stomach known as a scalchop, which can either be used as a weapon or to defend against attacks. Its Surf move can knock you right off the stage, but if you reflect it just at the right moment, that could really turn the tide back in your favour. Oshawott appears as one of the player character in PokéPark 2: Wonders Beyond. He's a self-proclaimed investigator for the Cove Area. At first he is suspicious of Pikachu and attempts to interrogate him, until Piplup tells Oshawott that Pikachu is a friend. Oshawott later chases after Pikachu and Piplup after they enter the Wish Park, and narrowly escapes from Cofagrigus with Pikachu. Oshawott's boss and mentor, Samurott then orders Oshawott to work together with Pikachu to investigate the Wish Park and anyone involved, and to rescue Piplup. Oshawott is also playable in Pokémon Mystery Dungeon: Gates to Infinity and Pokémon Super Mystery Dungeon. The player may choose to be transformed into Oshawott, or have the partner be one. The scalchop on its stomach is made from the same element as claws. It detaches the scalchop for use as a blade. Moves marked with a superscript game abbreviation can only be bred onto Oshawott in that game. For other sprites and images, please see Oshawott images on the Bulbagarden Archives. 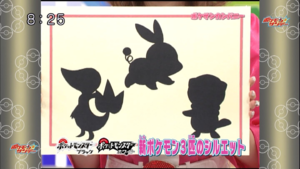 Oshawott and its fellow Unova starter Pokémon were first revealed as silhouettes on the May 9, 2010 episode of Pokémon Sunday. They were later revealed in full in the June 2010 issue of CoroCoro. Oshawott has the lowest base stat total of all Water-type starter Pokémon. Oshawott is the only Water-type starter Pokémon that is not a member of the Water 1 Egg Group. Oshawott, along with Snivy and Tepig, has the lowest base experience yield, with a base of 28. Oshawott was designed by Yusuke Omura. Oshawott is based on a sea otter pup and samurai. The way that Oshawott's scalchop rests on its belly resembles the way otters look when cracking open shells to eat. This scalchop also holds similarities with Japanese war fans, which were often used by samurai for defensive purposes. Ken Sugimori said that Oshawott and its evolutions were the hardest for the team to design during production, as conceptualizing its evolutions were difficult. They eventually settled on a samurai theme and making its final form a sea lion after a trip to an aquarium. Oshawott may be a combination of ocean, shell, water, and otter. It may incorporate a spoonerism of wash and the syllable ott from otter. It may be a reference to Oshawa, Canada, as Canada contains many protected areas in which sea otters reside, the name of which comes from the Ojibwa word aazhaway ("crossing the river" or "to leave one's canoe behind"). Oshawott may refer to Asherah, the Hebrew goddess also known as the "Lady of the Sea". It may also derive from George Ohsawa, a famed dietitian born into a poor samurai family during the Meiji Restoration of Japan. Mijumaru may be a combination of ? mizu (water) or ?? mijuku (naive or immature) and ? maru (round). Maru is also a common suffix in male Japanese names. Miju may also refer to an otter named Mijbil, the subject of an autobiographical novel and movie called Ring of Bright Water. Mandarin Chinese ??? / ??? Shuishuità From ? shui and ?? shuità.